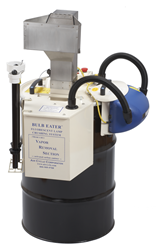 Air Cycle Corp.'s CFL Premium Bulb Eater is an updated version lamp crusher. It is designed to safely crush and store up to 3,000 compact fluorescent lamps prior to recycling, and can also crush tube lamps. The machine crushes lamps into 100% recyclable material, while capturing over 99.99 percent of mercury vapors in a 3-stage filtration system. It is available in select areas of the United States and internationally. When a drum of crushed lamps is full, Air Cycle will arrange for it to be picked up and recycled at the nearest EPA-approved recycling facility.